The last time I read an Amy Tan novel (The Hundred Secret Senses) was more than ten years ago. I don't remember the story at all, yet I remember being impressed with the movement of the story. The way Amy Tan weaves American values with Chinese cultural identity has always fascinated me. It resembles my own life and struggle with pop-American "cult"ure and my very Polynesian heritage. The Joy Luck Club is, by far, Amy Tan's most popular novel probably because it was made into a movie. This particular story covered a wide range of women issues centering on the sacrifices made for the sake of daughters. But deeper than that, it focused on the delicate mother-daughter relationship and how the generational gap can be bridged. The movie, in my opinion, is a dramatic masterpiece and should be a foundation for any chic-flick collection! 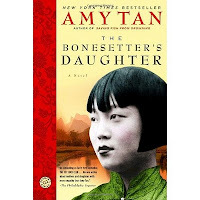 Thanks to my previous run-in's with Amy Tan's writings, I selected The Bonesetter's Daughter to read this week. I have to admit that I am just a hundred pages into the story yet I can already see Tan setting up the mother-daughter dynamic. She is also incorporating the conflicting east versus west argument. I'm interested in seeing where this book will lead and how it will all reconcile. So far, there is no mention of a bonesetter but it's very well-written. Rather, it's an easy read and not overly verbose.